I have read several posts stating that the solid brass window rollers really improve the movement on the rear 1/4 windows. I am thinking about making some of the rollers, but am wondering if they are as critical to the door windows. I know the rear 1/4's have some strange movements to get them to go up and down properly, but the door windows are pretty much straight up and down. Does anyone have any experience with the nylon rollers being offered all over Ebay? Also, it looks like the car may take 12 rollers, but looking at the prints I could only find 10. Notice how it uses a spring loaded tapered washer (at the top) to 'pinch' the track. Here's a brass roller using the spring parts from the OEM model. Last edited by simplyconnected; August 27th, 2013, 12:48 AM. Wasn't someone here on the forum making these brass rollers for sale? I think (but please correct me if I'm wrong) they are identical to those used on Little Birds also. Martin Burs (60 T-Bird) said in a post recently, that he is still sailing at sea. He expects that he will be back home in about 9 months, as I recall from his post. He said he will make some sets up for us once he gets back home and settled in. Martin has not given us permission to use that link yet that Dakota Boy posted. That is why we have not put it in the TRL yet. It might be a moot point now that we know these metal window rollers are available through CASCO, thanks to Joe Johnston. There is no mention of these being made of brass. They are said to be just like the original metal rollers. 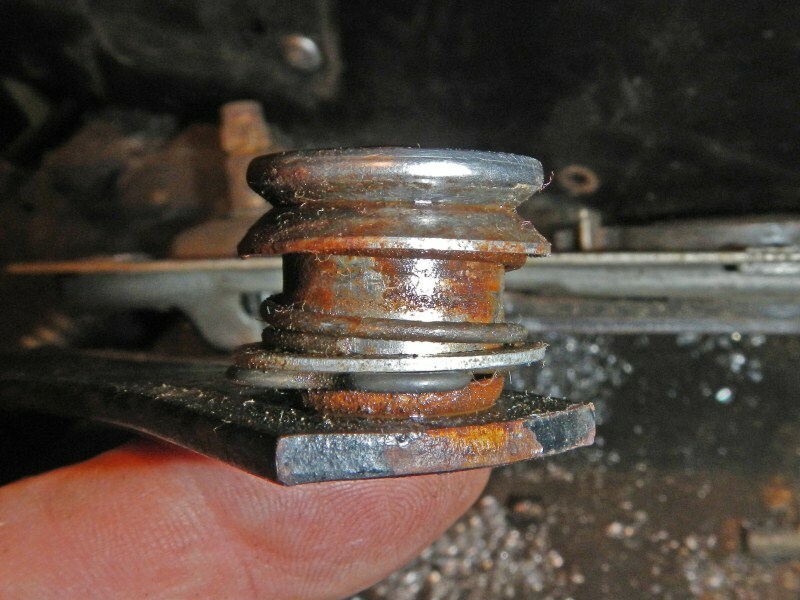 It is my understanding from Dave ~ simplyconnected, that these same rollers were in use not only in Little Birds, but also in Squarebirds, Bulletbirds, Flairbird and also Full Sized Edsels/Fords/Lincolns/Mercurys/Trucks (as far as we know) for quite a lot of years. Here is the link to the CASCO site for these window rollers that Dave sent me. There are 12 of them needed for a Squarebird. Probably the same for the 1961-1966 Tbirds. 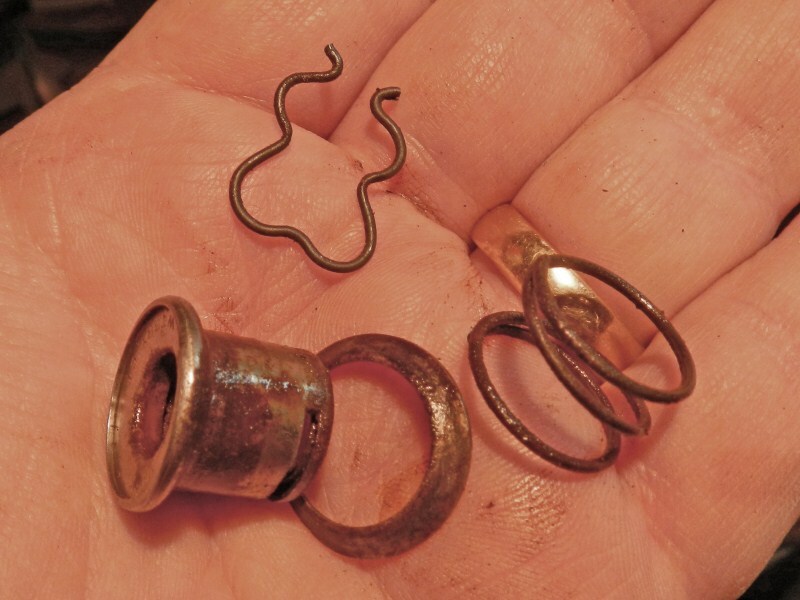 Since they are the same parts as Little Birds use, CASCO has them in metal shown complete with spring, washer and clip for those who want/need them now. Item # 23240M in their online catalog @ $8.50 ea. Qty. per Car: (6) <--Remember, these are Babybirds w/no rear windows. If they are made of metal I would have to guess @ $2.50 it would be just for the roller only - which is usually all we need. Good price for a pesky repair solution. I had one on the driver's side lower track that was well worn and was able to swap it with another that doesn't seem to take much load and looked like new. Amazing what a bit of cleaning and fresh grease does to window parts and gearboxes! I just talked with Ellis this morning at Tee-Bird. He said their window rollers are the plastic ones and come complete, not just the rollers. He did not know that CASCO was making original metal ones. I have just posted this link to the Technical Resource Library. You will find it in the Exterior section relating to Windows. Now we will have this information for posterity and easy access. Thanks, Joe Johnston, Dave Dare and others for the input. That is what I am beginning to think also. Clean and regrease. I have only checked 2 of my rollers so far, but both of them look really good when I check the sizes against the print for the brass rollers. As long as the size looks good and there are no flat spots, I am tempted to reuse the existing rollers. One advantage that I do see with the brass roller design is that the roller bearing surface on the pin is the full length of the roller. I'll see how things go. I may fab some of the brass rollers for the rear quarter windows, since those seem to be more tricky to get them adjusted and repeat movement. Its been a while since I worked on my window tracks, and bear in mind this was on my 57. Even though the rollers themselves are the same my "innards" are similar but probably different from yours. The assembly went much easier when I put the assembled roller unit in the slide of the track and then just pushed in the pin on the arm of the window lift and the spring snapped in place. I'm thinking one of these rollers had to be installed this way. On the production line, door glass came in containers. The glass was assembled with the bottom track with two rollers already installed. Remember, this must go fast. The assembler installed and set one door per minute. He grabbed glass out of the container, ran it over to the moving car, slid it down the door opening sideways, turned it and popped the scissors pins into all three rollers. Of course, the vent frame and lock-side track was already there but loose. You're not alone, Anders. Collision shops around Detroit would much rather buy a complete door from a bone yard, paint it and be done. 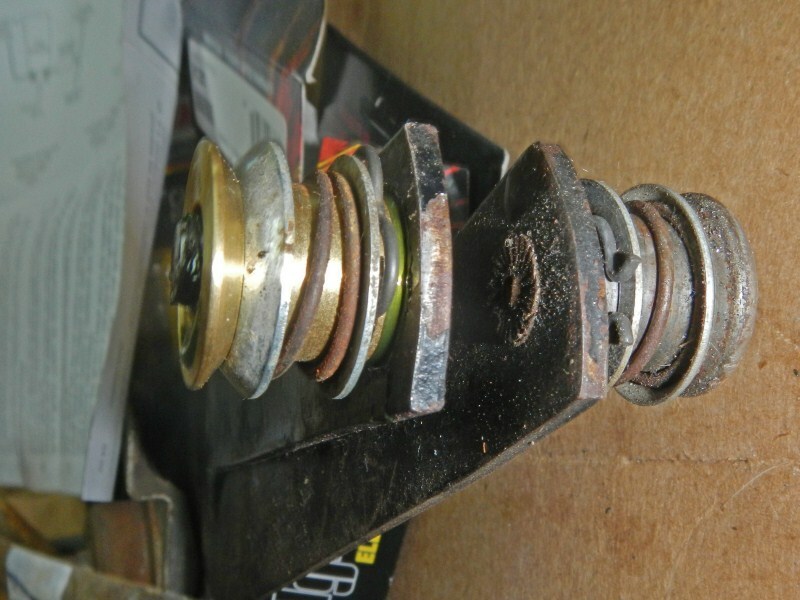 Classic car restorers are on their own to solve this puzzle. That's one of the reasons why buying an assembly line car is a very good deal. Each worker is a highly trained professional assembler, working within his classification (if he is 'union' as all Ford workers are). If you have never done this work, how would you know all the tricks or shortcuts? 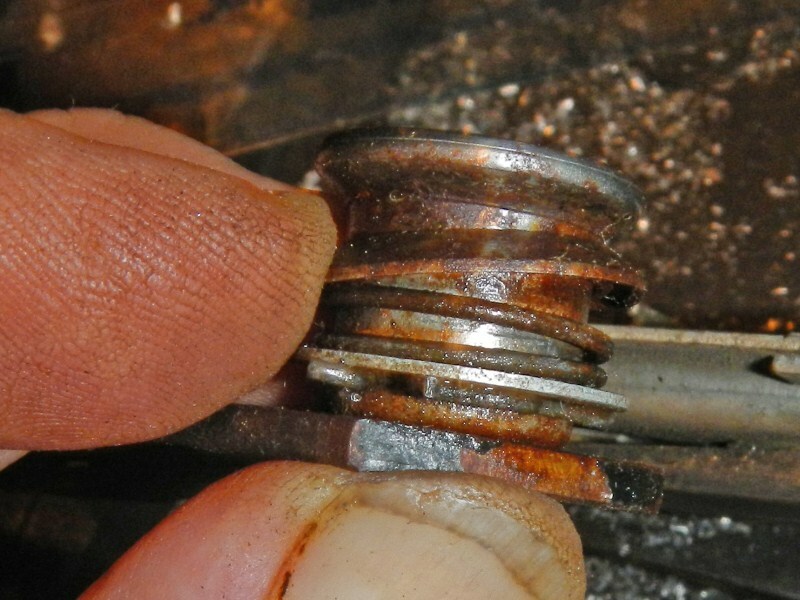 Pull the spring clip out and the pin will fall out of the roller. If you don't pull the pin, you will wrestle with the scissors. You may win if you get lucky.